In February 2009 we looked at a Univox Eagle P-Bass, and here we see its 6-string counterpart, the Univox Eagle Strat which is currently being offered for sale on eBay with a starting price of $499. A product of Japan's now legendary Matusmoko factory this late 1970s walnut-bodied beauty is a close relation of the Aria Pro II Dragon Strat which we have also looked before. 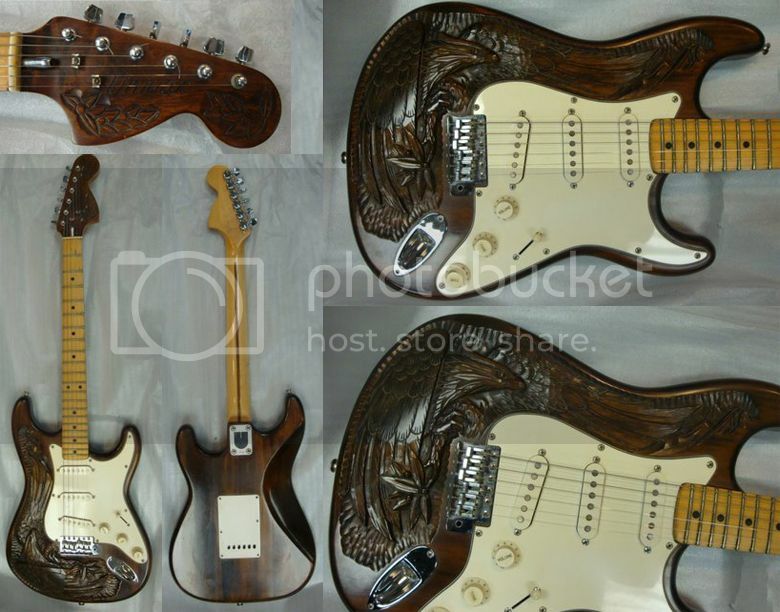 If you're on the lookout for a Strat but at the same time want something a little bit different from the norm, you could do a lot worse than to buy one of these, but be aware that they don't come up for auction too often. Having had played a friend's Dragon Strat years ago I can personally atest to the fact that they feel and sound great.